I absolutely love to teach writing. I feel like it is the one time of day that I can truly reach every student on THEIR level EVERY. SINGLE. DAY. It is also the one time of day that I can honestly say at least 90% of my students are fully engaged for 30+ minutes. It is also the only time of day that I tell my students to clean up and they moan and groan because they want to keep going. The way I really keep my students engaged and striving to new heights is through writing conferences because I can really customize our conference to fit their needs and it provides immediate feedback during the middle of their writing process instead of having them go back and fix something they are already finished with. Students need immediate and corrective feedback. And yes, there is a right and a wrong way to provide feedback. I know it is way easier to simply say "no, that isn't right", but what does a student really learn from that? Nothing. Instead, provide feedback to the student that lets them know their answer is incorrect, but lead them to learning why that answer wasn't right. Try something like "Well, if we were asking a question we would use a question mark, but read this sentence to me. What type of punctuation do you need?" Why is feedback so important? It takes 16 to 21 days to reverse a misconception. If you translate that into school days... that's approximately 3-4 weeks!! That's why IMMEDIATE and CORRECTIVE feedback that allows a student to learn from their mistakes and learn WHY they made a mistake is so incredibly important. The number one thing about feedback that you need to remember is that your goal should be to enhance the "writer", NOT the "writing". Handing back a writing with a bunch of red circles does not show the writer what they can do better. Feedback needs to be interactive and WITH the student! If you want to use a red pen to show errors, let the student use the pen to make the marks, etc. I like to have the student make corrections/additions in colored pencil... and trust me, they love it, too. By doing this, I can easily see what the student was able to do on their own, and what they did with my help. When giving feedback to a student during a writing conference, I like to use the 2 to 1 method. I have the student share their writing with me, then I point out two things I really liked during their writing (I usually try to find a skill we've recently had a mini-lesson on) and then I share ONE thing that I want them to try or keep in mind for next time. Let's be honest, there are about ten things on every writing that are going to drive you insane. But remember that your writers are only 6 or 7 years old. You can't expect them to retain ten lessons or skills in one day. Find one thing that you think will benefit them the most and work on that ONE thing. 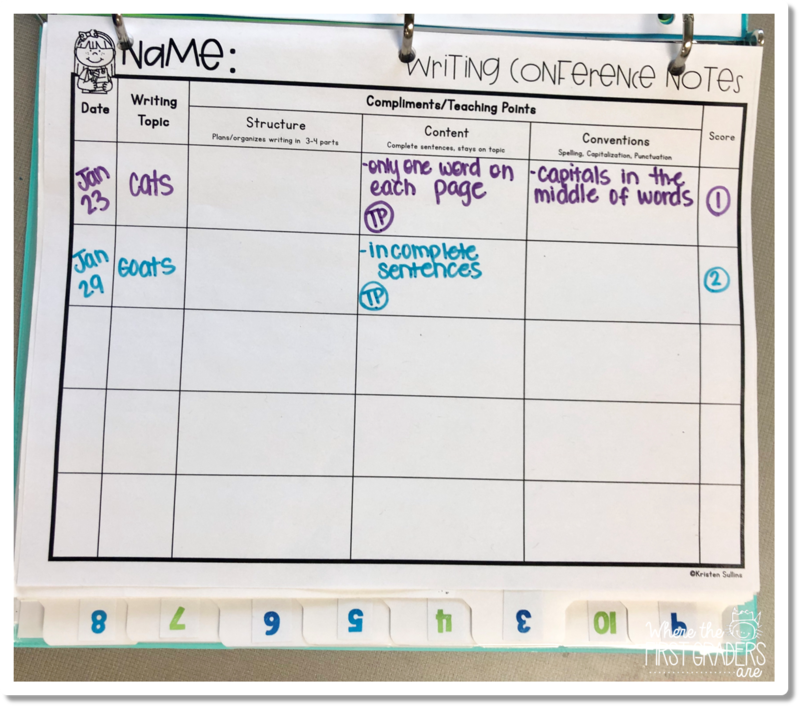 I try to make a note of their 2 to 1 comments so that the next time I meet with them I can say "last time, we talked about doing ___ and I love that I see that on page 2". Documenting those comments also helps me plan ahead in case I want to pull a group of 3 or 4 who all really need to work on capitalization, etc. Sometimes you will only have good things to tell a student about their writing and that's OK! They deserve a full on win every once in a while without the "you were great, but you need to work on this". The Seven Up Rule: Powerful sentences are seven words and up! Sparkle Words: instead of I "went"... I "wandered", I "drudged", I "chased"
Sensory Details: "The hot sun made the sweet ice cream melt into a sticky puddle". 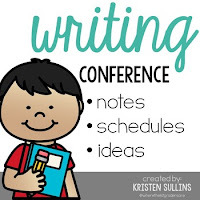 The Writing Conference is also a great time to really meet your beginning writers at their level. I like to pull a strategy group of 3 or 4 students who need substantial guidance. I talk to one student while the rest of the group listens. 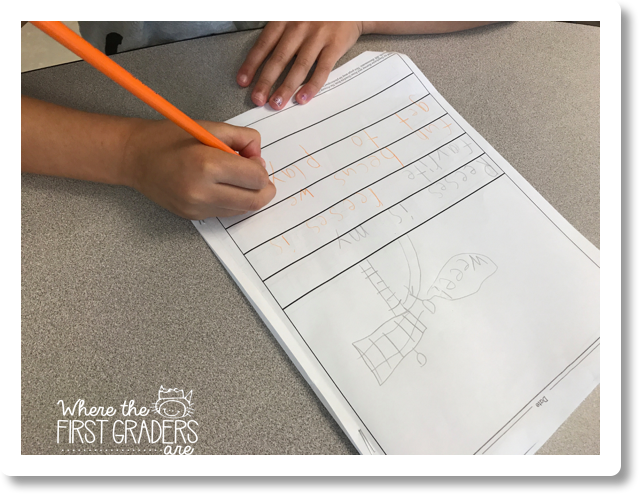 The student provides a sentence and as a group, we count the number of words in that sentence. Then I use a highlighter and mark that many spaces on their paper. 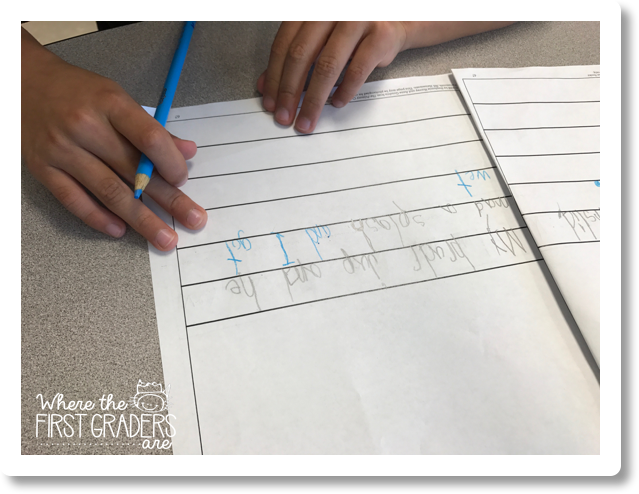 As a group, we help that student restate their sentence as I help them match the words to the spaces. We repeat this process for each student at the table. 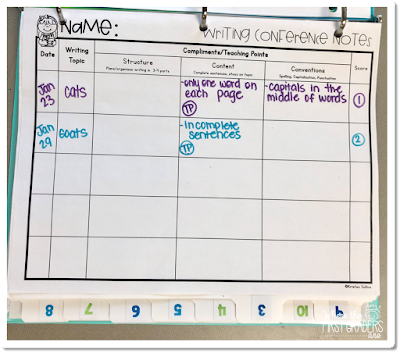 After a while, you will be able to help that student plan a page at a time rather than a sentence at time. There are so many different ways to track feedback and there is honestly no right or wrong way to track feedback. It's all about what works for you. This is the form that I use. I like to track what kind of errors I saw in their writing as they are reading to me and then I mark the "teaching point" I chose with "TP". 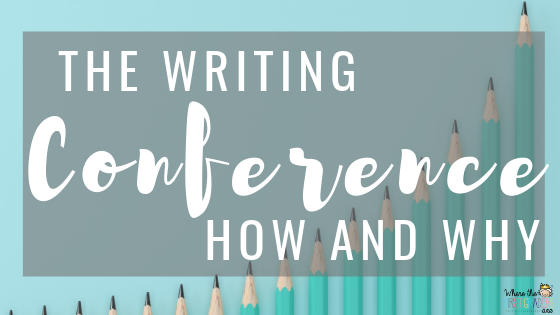 One thing that I've learned from writing conferences is that you really have to focus in on ONE teaching point or else your students may get overwhelmed or discouraged. Another reason I really like to track my feedback is to use it to plan my writing goals and strategy groups. 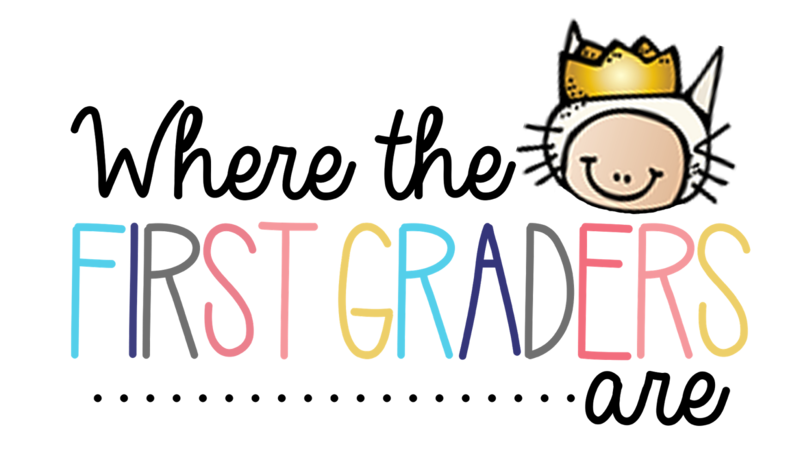 A strategy group is a group of students who need to work on similar skills such as capitalization, punctuation, adding details, etc. I like to get my entire class writing independently, then pull my strategy group back to my table for 5-10 min, then let them go back to their desk while I return my focus back to the rest of the class. You can pull students as a strategy group or pull them independently. 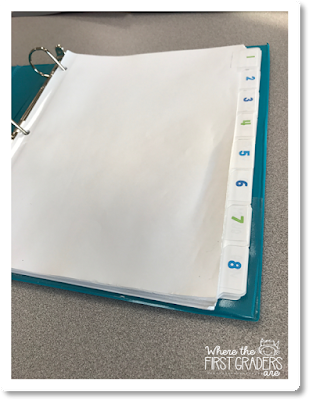 I keep a binder with 22 dividers in it. I numbered them 1-22 so that I did not have to keep changing names each year and I assigned a number to each student (I usually do this anyway). This was a super easy way to find notes on a student. 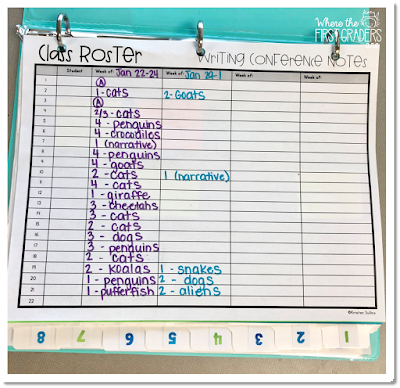 Everything went behind that divider, whether it was a nice, neat conference log, a sticky note or even a writing sample that I needed to save a copy of for documentation. 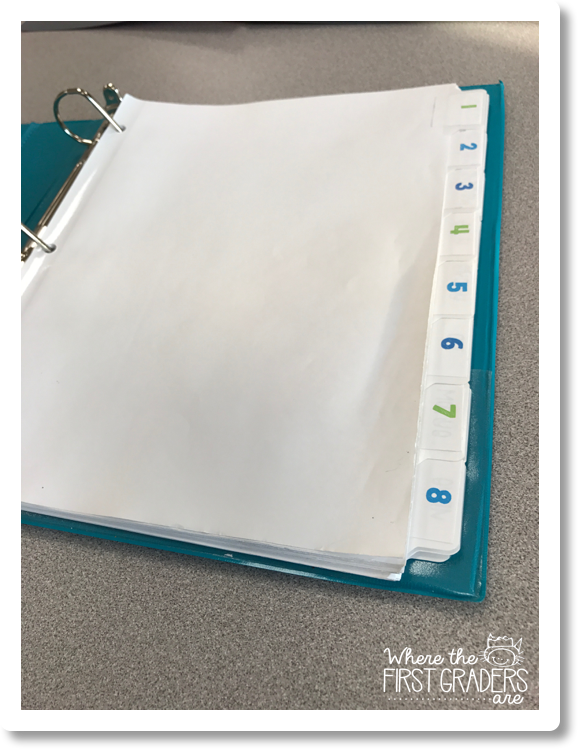 I also kept a scheduling sheet in the very front of my binder where I could track which students I had already seen and who I needed to "SIT" with. I tried to see every student at least once a week, and then I had my special friends that came to me two or three times a week. 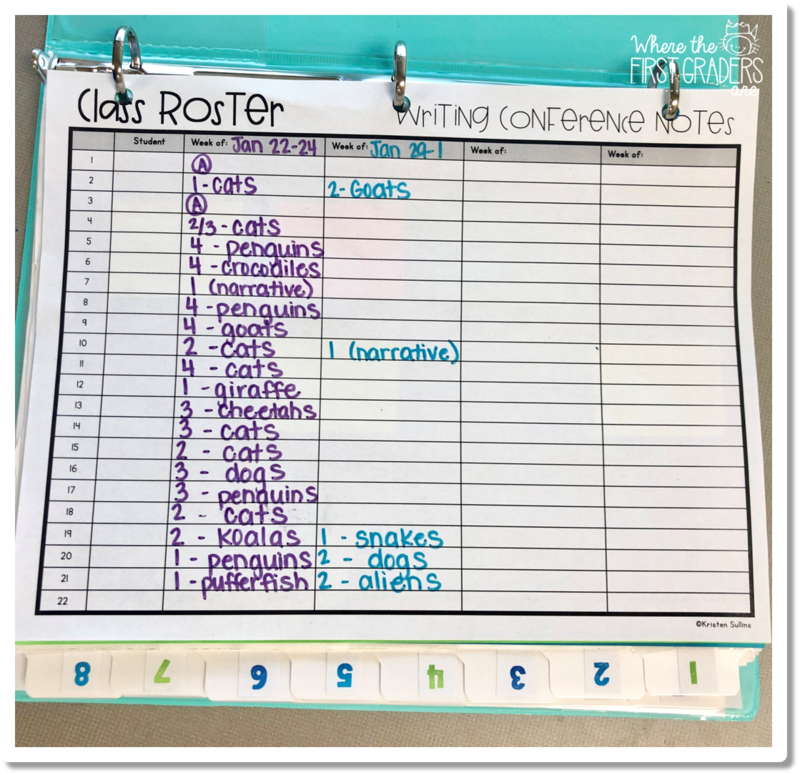 After my scheduling sheet, I keep my grouping pages so that I can group students of similar abilities/teaching points to help maximize my writer's conference time. These can also be found in my Writing Conference Forms product.